Background: There are many Greens on the Eastside of Los Angeles County who want to apply to be County Council members. However the Septmeber County Council is proposed to be in the Antelope Valley, while October would be in Los Feliz. To make it easier for the Greens applying for the County Council, this proposal would switch those two meetings. Proposal: That the September 10 County Council meeting be held in Los Feliz at 4344 Russell Ave. and the October 22nd meeting in the Antelope Valley. Green Party member Lawrence Zeise is running for the newly forming Hermon Neighborhood Council http://empowerla.org/hermon-2017-open-seats/. Zeise is a former appointed member of the Arroyo Seco Neighborhood Council http://www.gpelections.org/races/lawrence-ziese-appointed-to-neighborhoo..., for which he was the Hermon area geographic representatives. He also served as the Chair of its Planning and Land Use Committee. Professionally Zeise is a landscape architect https://www.linkedin.com/in/ashcrow/. A community leader motivated to improve Safety, Schools, and Sustainability! - Schools: Work with our amazing parents and faculty of Bushnell Way and LA Charter High to provide better funding and volunteer opportunities. Our kids are our future! - Sustainability: More trees, street improvement, native fireproof landscaping, and better waste handling! Let’s Work Together! Background: There will be a special election this fall to fill a mid-term vacancy in State Assembly District 51 http://www.latimes.com/politics/essential/la-pol-ca-essential-politics-u... The date has not been announced by Governor Brown. Background: Under GPCA Bylaws 13-2 http://www.cagreens.org/bylaws/2016-07-03#Article_13-2_Amendment, County Green Parties may sponsor amendments to the GPCA Bylaws. Before they are forwarded to the General Assembly or the Standing General Assembly, each proposed amendment must be submitted to the Bylaws Committee, for its review and recommendations to the sponsors, including to promote consistency in numbering, format, terminology and meaning with existing documents, and to minimize ambiguity and to promote clarify. The proposal attached below is under consideration by the Green Party of Contra Costa and is seeking GPLAC co-sponsorship. Background/Purpose: This proposal has five parts. The first part is to clarify that to be eligible to run for GPCA state Coordinating Committee and/or the GPCA's GPUS Delegation, one must be a Green Party member in the state of California as defined in Article 3 of the GPCA Bylaws (http://www.cagreens.org/bylaws/2016-07-03#Article_3._Membership) at the time of application for the position and remain so through the conclusion of the election. This is accomplished by amending Article 8 Coordinating Committee and Article 12 Delegates to the Green Party of the United States to specify this condition of eligibility. Note that GPCA Bylaws 3-2 specifies that only registered Green Party members in the state of California may serve on the Coordinating Committee, whereas other GPCA members as defined in 3-1 ("County Organizations may also extend GPCA membership to county residents who are not otherwise eligible to register to vote in California, but who affirm in writing the Ten Key Values and the GPCA's purpose, and meet other criteria established by the GPCA and/or the county organization. For such membership to be valid within the parameters defined in these bylaws, the County Organization must forward minutes to the Coordinating Committee of the meeting at which such membership was extended.") may serve as members of the GPCA's GPUS Delegation. The second part of this proposal would remove a contradiction in the Bylaws between 7-6.2 (http://www.cagreens.org/bylaws/2016-07-03#Section_7-6_Standing_General_Assembly , most recently updated on 7/3/2016), which requires that elections for both the GPCA state Coordinating Committee and the GPCA's GPUS Delegation be conducted by the Standing General Assembly, and 12-4 (http://www.cagreens.org/bylaws/2016-07-03#Section_12-4_Elections, most recently updated 10/3/06, written before the advent of the Standing General Assembly ) which specifies that elections to the GPUS Delegation be conducted at the General Assembly. Since the advent of the Standing General Assembly, elections for the GPUS Delegation have been conducted via the Standing General Assembly and this new proposal would also remove the old language about the GPUS Delegation elections being conducted at the General Assembly. The third part of this proposal addresses timing for Standing General Assembly elections in months where there are five Mondays in May instead of four, by amending 8-4.2, 12-4 and 7-6.3(a) http://www.cagreens.org/bylaws/2013-06-23#Section_7-6_Standing_General_Assembly ). The current bylaw provides for the discussion period for the annual spring Coordinating Committee and GPUS Delegation elections to begin on the first Monday of May. This timing was originally designed to allow for the six weeks discussion period and the one week voting period to end as late as possible in June, so that the GPCA could hold its spring budget General Assembly during this period. The reason for this was to ensure that candidates for the Coordinating Committee and the GPUS Delegation elections could have the opportunity to speak in person to the spring budget General Assembly. However in approving 7-6.3(a) and 8-4.4, it was not considered that in some years there are either five Mondays in May or in June. In that case, starting the spring Standing General Assembly discussion period on the first Monday of May could cause the voting period to conclude before the spring budget General Assembly. Since the new Coordinating Committee and the GPUS Delegation terms would not start until the ensuing July 1 of that year, regardless whether the election concluded a week early, the net effect of an early election only would potentially deprive the General Assembly from hearing the candidates. This proposed amendment would account for this by adding the following language to the end of Bylaw 7-6.3(a) as per below in the Proposal section: ", except that in years where there are either five Mondays in May or in June, the discussion period shall begin on the second Monday of May." A different version of this proposal to address this issue would have changed the submission date for candidate applications along with the change in date to begin the Standing General Assembly (http://sga.cagreens.org/vote/propresult?pid=120), potentially creating confusion for potential applicants on when they can apply depending upon the year. This proposal would leave the submission date the same (the last Monday of April) each year in order to eliminate any such confusion, while also adding clarity that the deadline would be 11:59pm on that last Monday. The fourth part of this proposal would add consistency in how unscheduled, mid-term vacancies are filled for seats on the GPCA's GPUS Delegation. Currently there is language in the Bylaws 8-4.5 (http://www.cagreens.org/bylaws/2016-07-03#Section_8-4_Elections) specifying the process for filling such vacancies on the Coordinating Committee via the Standing General Assembly, while the language for filling such vacancies on the GPUS Delegation still refers to filling them at the General Assembly. This proposal would amend that to provide for the same Standing General Assembly text and process as for the Coordinating Committee. The fifth part of this proposal would provide for consistency in abbreviations and capitalization in Article 12, as compared to the rest of the bylaws. When the Bylaws were amended in 2013, abbreviations were eliminated except when referring to the GPCA (Green Party of California) and the GPUS (Green Party of the United States), such that committee names and other internal organs of the GPCA were spelled out in full and capitalized in their first letter. This proposal would apply that same formatting to Article 12. The sixth and final part of this proposal is a housekeeping removal of text that was included in 8.4.5 when it was amended in June 2013 that was to be included for 2013 only and then deleted - "Not withstanding the above, for 2013 only, there shall be a separate, one-time election for male and for female seats, combining unfilled two-year seats in the election, and the remainder of one-year seats not previously scheduled for election until 2014, where the top vote getter(s) will fill the two-year seats and the others will fill the one-year seats." 8-4.1 Elections shall be conducted each year by the Standing Green Assembly by secret ballot, using Ranked Choice Voting with a No Other Candidate option, with the six week discussion period beginning on the first Monday of May and the one week voting period commencing immediately thereafter. 8-4.1 Elections shall be conducted each year by the Standing Green Assembly by secret ballot, using Ranked Choice Voting with a No Other Candidate option. There shall be a six week discussion period beginning on the first Monday of May and the one week voting period commencing immediately thereafter, except that in years where there are either five Mondays in May or in June, the discussion period shall begin on the second Monday of May. 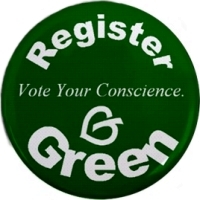 8-4.2 To be eligible, candidates must submit an application to the Coordinating Committee by the last Monday of April, be registered as a member of the Green Party in the state of California at the time of application for the position and remain so through the conclusion of the election. Any candidate who fails to remain registered as a member of the Green Party in the state of California during this period shall be removed from the ballot prior to the commencement of the voting period, should their registration from Green Party change prior to the commencement of the voting period; and should their registration from Green Party change during the voting period, the votes shall be calculated without inclusion of said candidate. Elections shall be conducted each year by the Standing Green Assembly by secret ballot, using Ranked Choice Voting with a No Other Candidate option. There shall be a six week discussion period beginning on the first Monday of May and the one week voting period commencing immediately thereafter, except that in years where there are either five Mondays in May or in June, the discussion period shall begin on the second Monday of May. 12-4.2 To be eligible, candidates must submit an application to the Coordinating Committee by the last Monday of April, be a Green Party in the state of California as defined in Article 3 at the time of application for the position and remain so through the conclusion of the election. Any candidate who fails to remain a member of the Green Party in the state of California during this period shall be removed from the ballot prior to the commencement of the voting period, should their registration from Green Party change prior to the commencement of the voting period; and should their registration from Green Party change during the voting period, the votes shall be calculated without inclusion of said candidate. Upon a mid-term vacancy occurring on the Delegation (but not a vacancy occurring as a result of any seats not being filled during an annual regular election), the Coordinating Committee shall publish a Notice of Vacancy and Call for Candidate Submissions to the active County Organizations, for candidates seeking to fill the remainder of the vacated term. The Notice shall contain the timing of the submission, discussion and election process, and the time remaining in the term for which a vacancy has occurred. The Notice shall be published within two days of the vacancy occurring. The submission deadline shall be 21 days from the publishing of the Notice. The discussion period shall begin on the first Monday after the close of the submission period. No vacancy shall be noticed to be filled if from the resultant timeline above, the seat would be filled after the first Monday of the April before the end of the vacated term. 7-6.3(a) The discussion period for Proposals and Elections shall be six weeks, beginning on a Monday at 12:01 am and ending on a Sunday at 11:59pm. The discussion period for Coordinating Committee and GPUS Delegation elections shall begin on the first Monday of May, except that in years where there are either five Mondays in May or in June, the discussion period shall begin on the second Monday of May. Part 4: That Article 12 be amended such that every place where the Coordinating Committee is referred to as the 'CC', that 'CC' be replaced by the full two words 'Coordinating Committee'; that where the word 'delegation' is written in lower case, that it be replaced by 'Delegation'; that where the GPUS National Committee is referred to as 'NC', that it be replaced by National Committee; and that where the General Assembly is referred to as 'GA', that it be replaced by 'General Assembly'. Part 5: That the following text be deleted from 8.4.5: "Not withstanding the above, for 2013 only, there shall be a separate, one-time election for male and for female seats, combining unfilled two-year seats in the election, and the remainder of one-year seats not previously scheduled for election until 2014, where the top vote getter(s) will fill the two-year seats and the others will fill the one-year seats."